Some of the most valuable comics around are Marvel comics. And that’s for good reason- they publish some of the most legendary, loved and timeless superheros such as Spider-Man, Iron Man, Captain America and many, many more. It’s important to identify why you want to sell your comics, because that will dictate the best place to sell them. Do you need money fast? Do you want to maximize your investment and sell for a high price? Do you want to clear space and simply get them off your hands? Once you decide why you’re selling, you’ll need to start organizing your collection. Hopefully you’ve stored your Marvel comics properly as this will make this much easier. Keeping your comics stored and organized properly will ensure they keep their value over time, and will simplify the selling process especially if you have a larger collection. 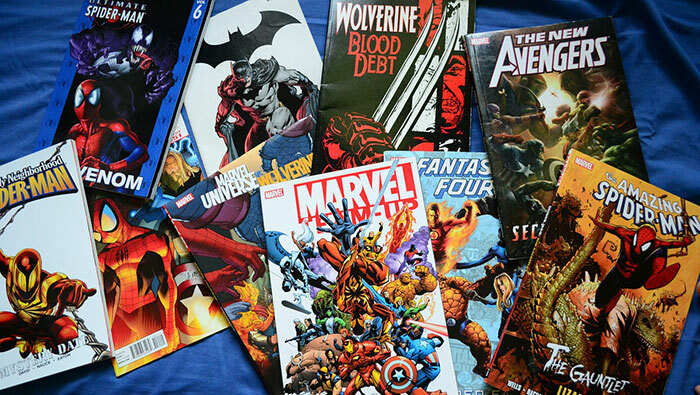 If you believe your comics or collection is worth a significant amount, you’ll want to consult professionals to ensure you’re aiming for a fair market price as well as guide you to the best potential places to sell them. Professional appraisals can be fast and easy if you work with a reputable person. If you want to sell fast, then you’ll want to avoid selling online and instead sell to a local pawn shop or comic book store. If you want to sell for the most amount of money, you’ll want to sell to a broker or on an online marketplace. To get the best of both worlds — fast, easy transactions and top-dollar all-cash offers — look no further than selling your Marvel comics to Sparkle City Comics. We buy millions of dollars worth of comics every year and pride ourselves on making those transactions as fast and as easy as possible. That’s why people come back to us time and time again when they need to sell their comics. Would you like us to take a look at what you’re selling and potentially make a top-dollar all-cash offer? Give us a call at 800-743-9205 or fill out this seller inquiry form and we can get the process rolling! I’ve had these comic books for over 40 years I have a 1962 Incredible Hulk Edition and I have many more I would like to get the fair value of them and then sell them I believe that y’all may be a people that’s fair and just. That’s why I wanted to deal with you all.